findViewById is one of the most annoying boilerplate code in Android application development. This part of code unnecessarily requires bunch of line of codes and can easily cause an expected behavior unintentionally. Some library was invented to reduce this part of code's size, for example, the popular Butter Knife which adopts Annotation processing to help mapping between Java's variable and ID declared inside layout XML file. Anyway, although it could help reducing a signifant number of line of codes but it still requires some effort and can still cause some mistake since you still have to declare @BindView manually one by one. Here we go. This blog will introduce you the perfect solution to totally eliminate these annoying codes away using god-level Data Binding Library. 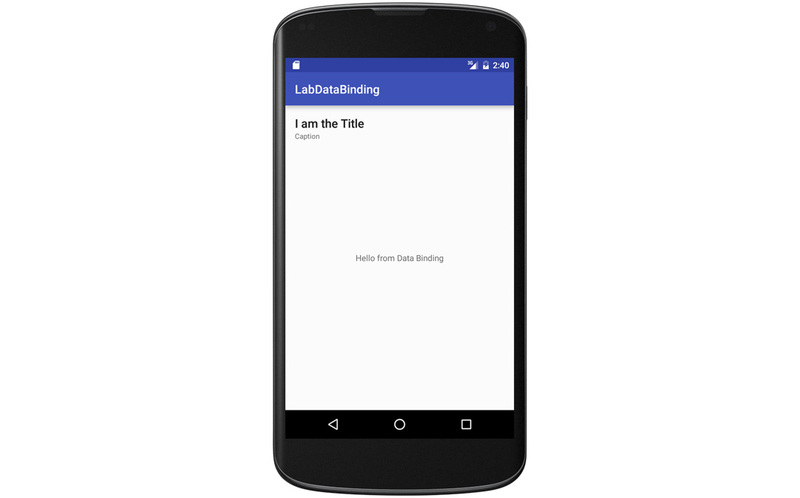 To use Data Binding Library, you need to use Android Studio 1.5 or higher version. Anyway I believe that most of you have already upgraded to version 2.0 already so this should not be a problem. And then open module's build.gradle and add the following line in android block to enable Data Binding. At this step, please build your project to let Data Binding Library auto generating neccessary files for you. You need those for the further steps. You may notice that ActivityMainBinding is used here although you didn't declare it anywhere. There is nothing magical here. ActivityMainBinding.java was previously auto generated by Data Binding Library when you built your app minutes ago. Its class name comes from activity_main.xml file's name which is turned into Upper CamelCase before appending with Binding, ActivityMainBinding. This is the way this library use to turn file's name into class name. You can use this logic in every single case. And now it's time to access View inside activity_main.xml. Well ... you can simply access it through binding variable using its ID like this ! As you can see, boilerplate findViewById code are all eliminated. Moreover, you have no need to declare even a single variable to access View. The code will still be the same although you add more 100 Views to this layout. Cool, isn't it ?!? The way to inflate your layout into Activity has already shown above. And how's about inflating into Custom ViewGroup or Layout to create your Custom View. Can we do it? Definitely yes ! And it is as easy as above sample. First of all, you need to modify your layout XML file by adding <layout>...</layout> as a Root Element. And then use this line of code to inflate the layout. Code pattern is still be the same as the way we normally do layout inflation. The only change is you need to inflate using the auto-generated Binding class instead, which is ItemBloglistBinding in this example. Again, its name is converted from item_bloglist.xml. Here is the full code snippet how to inflate item_bloglist.xml into FrameLayout and automatically gain access to all Views indie. * Created by nuuneoi on 6/28/2016. Now let's try to place it somewhere in activity_main.xml. You can notice in the sample above that every single @+id declared in XML file are automatically turned into Java variables as XXXBinding's member variable. We should know more in details on how this library uses to convert the id to variable name to prevent the further problem. Actually the way this library use to convert id to variable name is as simple as: "Turn every id(s) into camelCase"
Don't worry that there would be a problem. Data Bind Library is smart enough to seperate those two apart. But since those variable names are just the same so at the final, you will get two variables: tvHello and tvHello1 instead to access those two TextView respectively. Anyway, although it is usable but it may cause some confusion. To prevent this, it is recommended to set id in only a single format, either camelCase or Underscores. Choose just only one and everything will be good.